reminiscent of "elections" in North Korea. January 1, 2014 (Tony Cartalucci) - In protest of unelected dictator Thaksin Shinawatra and his proxy regime led by his own nepotist-appointed sister Yingluck Shinawatra, anti-regime protesters plan to shut down Thailand's capital of Bangkok starting on Monday, January 13, 2014. The necessity of continued mass mobilizations is due in part to the current regime's immense foreign backing - including across the West's mass media who continue to claim Thaksin Shinawatra's rule is legitimate despite him being a convicted criminal hiding abroad and openly running the country through a series of nepotist proxies which have included both his brother-in-law and now sister. While unthinkable and unacceptable in any other country, news fronts such as the BBC, New York Times, CNN, Reuters, AP, AFP and others insist that this cartoonish, criminal arrangement is somehow representative of "democracy" in Thailand. There is no question that an accused mass murderer and convicted criminal hiding abroad from a 2 year jail sentence, multiple arrest warrants, and a long list of pending court cases, is illegally running Thailand by proxy. Of course, just as a convicted criminal running America or England via Skype would be a laughable prospect entirely unacceptable by Americans or English, likewise, it is unacceptable in Thailand. The sham elections the regime is planning for February 2, 2014 which have Thaksin Shinawatra's sister and brother-in-law once again at the top of the candidate list, have already been boycotted by all opposition parties, leaving the regime alone posting campaign posters along Thailand's roads, reminiscent of scenes of sham elections carried out in North Korea. For Thailand, the protests will continue until the regime falls. For the West and its media houses, they will continue to spend their credibility recklessly until they are entirely bankrupt, just as they have in regards to Iraq, Libya, Syria, Egypt, and everywhere else they choose to lie on behalf of the monied elite of Wall Street and London instead of doing their duty to impartially inform the people - a duty that is necessary for a truly free and prosperous society. Who is Thaksin Shinawatra and Why do People Detest Him? In the late 1990's, Thaksin was an adviser to notorious private equity firm, the Carlyle Group. He pledged to his foreign contacts that upon taking office, he would still serve as a "matchmaker" between the US equity fund and Thai businesses. Thaksin was Thailand's prime minister from 2001-2006. Has since dominated the various reincarnations of his political party - and still to this day runs the country by proxy, via his nepotist appointed sister, Yingluck Shinawatra. In 2001 he privatized Thailand's resources and infrastructure including the nation's oil conglomerate PTT - much to Wall Street's delight. In 2003, he would commit Thai troops to the US invasion of Iraq, despite widespread protests from both the Thai military and the public. 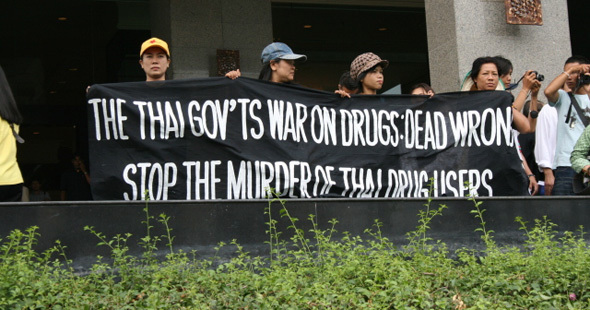 Thaksin would also allow the CIA to use Thailand for its abhorrent rendition program. Also in 2003, he initiated what he called a "war on drugs." Nearly 3,000 were extrajudicially murdered in the streets over the course of just 90 days. It would later turn out that more than half of those killed had nothing to even do with the drug trade. In this act alone, Thaksin earned himself the title as worst human rights offender in Thai history, and still he was far from finished. In 2004, he oversaw the killing of 85 protesters in a single day during his mishandled, heavy-handed policy in the country's troubled deep south. The atrocity is now referred to as the "Tak Bai incident." 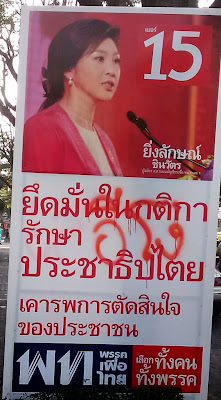 Also in 2004, Thaksin attempted to ramrod through a US-Thailand Free-Trade Agreement (FTA) without parliamentary approval, backed by the US-ASEAN Business Council who just before the 2011 elections that saw Thaksin's sister Yingluck Shinawatra brought into power, hosted the leaders of Thaksin’s "red shirt" "United Front for Democracy against Dictatorship" (UDD) in Washington DC. Throughout his administration he was notorious for intimidating the press, and crushing dissent. According to Amnesty International, 18 human rights defenders were either assassinated or disappeared during his first term in office. The Committee to Protect Journalists (CPJ) claimed in its report, "Attacks on the Press 2004: Thailand" that the regime was guilty of financial interference, legal intimidation, and coercion of the press. Since the 2006 coup that toppled his regime, Thaksin has been represented by US corporate-financier elites via their lobbying firms including, Kenneth Adelman of the Edelman PR firm (Freedom House, International Crisis Group,PNAC), James Baker of Baker Botts (CFR, Carlyle Group), Robert Blackwill (CFR) of Barbour Griffith & Rogers (BGR), Kobre & Kim, Bell Pottinger (and here) and currently Robert Amsterdam of Amsterdam & Partners (Chatham House). It is not mere corruption that protesters are opposed to. 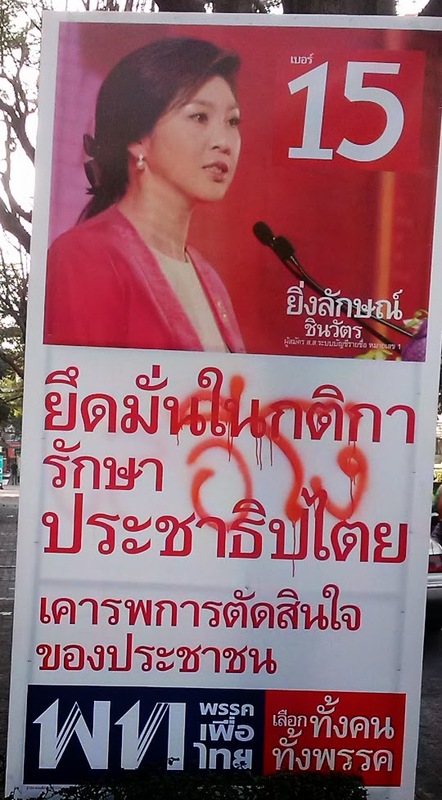 It is Thaksin Shinawatra's ability to mass murder with absolute impunity, and the wild popularity his wrecking ball abandon and criminality earns him among his minority support base of poorly educated, highly exploited radical supporters and a long list of foreign backers. The Shinawatra regime represents the ingredients of a dangerous dictatorship that threatens Thailand's future, not democracy. The business ties between Shinawatra and the West make it clear why the Western media overlooks his serial crimes against humanity, and why the West will continue to support the Shinawatra regime no matter how ridiculous or despotic its behavior becomes. From accusing protesters of dressing up as an entire battalion of police, to shooting their own police officer from rooftops they alone controlled during recent clashes, the Shinawatra regime has proven itself unfit and unqualified for rule in a civilized nation governed by the rule of law. Image: This isn't the first time Thais had to take matters into their own hands. Mass murderer Thaksin Shinawatra was granted a special visa to enter the United States in 2012 to give a speech to his supporters. Even while the US uses human rights as leverage against nations that fall from its favor, they had no problem letting Thaksin Shinawatra travel freely within their territory. It was Thais living in Los Angeles that eventually ran the deposed dictator out from his planned venue, not the West's self-appointed arbiters of international order. For outsiders looking in, this is precisely why further mass mobilizations are necessary and why protesters will be taking to the streets in early 2014 - to hold accountable a criminal regime given a free pass by everyone else.